One of the stranger stories from the 1950s is the tale of how Woolworth's found its way onto the national curriculum. The unsolicited compliment highlights the chain's status as the UK's leading retailer at the time, although it's hard to know whether being used as an instrument of torture in the classroom would encourage more kids to shop and work in the stores or not! As you can see in our Woolies by Woolies at Woolies feature, occasionally Woolworth itself featured in products sold in the stores. For example scale replicas of the buildings and lorries adorned trainsets and layouts across the nation. But the Fifties saw a much greater compliment, which was neither engineered nor influenced by the Company. After the Second World War there was a drive to modernise and improve the country, as people challenged the practices of the past, and tried to shape a new Britain for a new generation. This was particularly true in education, where progressive teachers were determined to break away from the copybook and parrot fashion learning of their own childhoods. They sought a new curriculum which would get children interested and involved in their classes. For one educationalist, Winifred M. Ferrier, this signalled a move away from the traditional blackboard and times tables method. She proposed a new approach to mathematics that was altogether more practical. 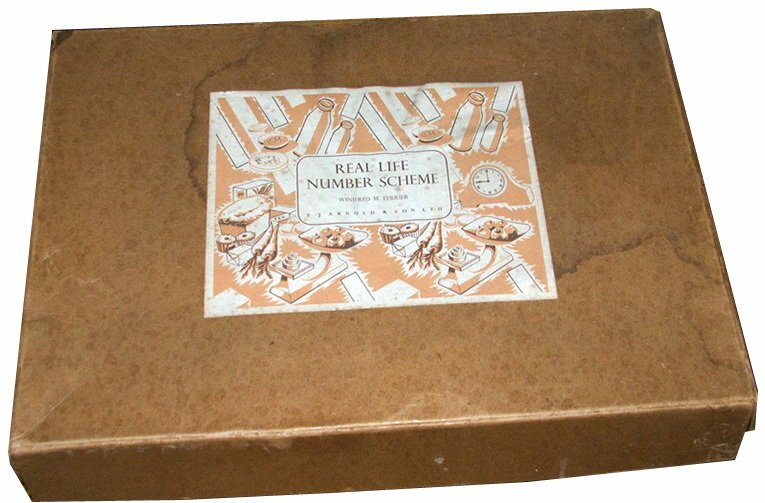 Ferrier assembled a complete resource kit to help maths teachers, in the form of a 'Real Life Number Scheme', which was adopted by many Primary Schools across England and Wales. The kit was developed in partnership with the Toy Maker R. J. Arnold and Son of Leeds. It was a 'tardis' of a box that was dull and boring on the outside, but packed with new learning ideas on the inside. The contents were packed into a set of brightly coloured envelopes and packs. There were cardboard coins. Some were mounted on cards, while others were loose. Pupils used them to grasp Britain's strange duo-decimal money. There were twelve pennies to a shilling (5p) and twenty shillings to a pound (making 240 pence to the pound). There were also coins with unusual values, like the 'half-crown', worth two shillings and sixpence or 12½p. The smallest banknote was worth ten shillings (50p), and one pound was also a banknote. Other learning packs included tape measures and forms to record the length and width of a number of specially prepared items. There were also weight tests, complete with a miniature scale. Most of the practical exercises were related to shopping. Teacher notes explained how the packs could be used to prepare a series of fun lessons. Each class focused on a single application of maths in daily life, at work or play. When it came to shopping, there was of course a newsagent and sweet shop, a café and a Christmas Decorations store. Each had no name in the kit, but was very similar in layout to the interior of a Woolies of the day. But at the heart of the kit was an F. W. Woolworth & Co. Ltd. variety store which seemed to sell everything. 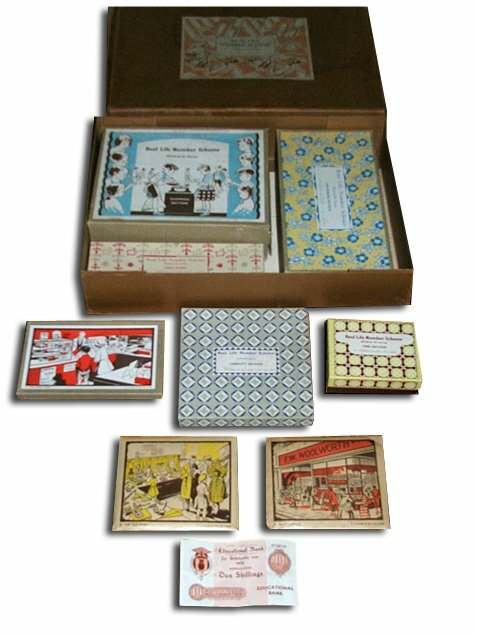 According to the pack it was the place to buy dolls, beads, dogs and birds, model steam liners, sweets, toy cars and candles. At one time or another Woolworth had sold all of the items, and was even experimenting with a live pets department at the time ! 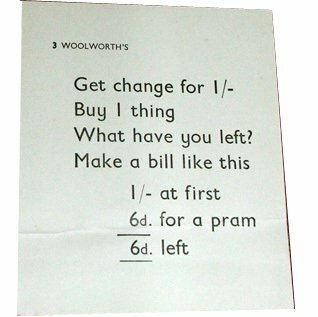 The pack placed a Woolies advert on schoolchildren's desks at a very impressionable age. At the time Woolworth was such a part of British life that no-one gave this a second thought. The chain did not ask or pay for the privilege. Today the major supermarkets fall over each other to sponsor initiatives to buy sports equipment and computers, or to plant seeds and gardens at schools. These aim for the same result. Many of today's parents and grandparents were actually tested at school to see whether they could add up a basket of Woolworth's shopping. Teachers threatened their weaker pupils with a career at the store as a punishment if they failed the test. Woolies was painted as some kind of correctional facility for underperformance in the classroom. Little did they know that, without the benefit of barcodes and cash registers that added up the value of customer purchases, the retailer expected its 100,000 sales assistants to do the maths in their heads. At work supervisors took on the role that teachers had performed in the classroom, checking their staff's arithmetic. They returned the compliment, threatening those making a mistake with "being sent back to school"! The pack included this worked example. The simple subtraction is made a little more complicated by there being twelve pennies in a shilling and twenty shillings in a pound! To complete the subtraction test children had to say how much change they would have left out of their one shilling a week (5p) pocket money. A shilling was twelve pennies (written down as 1/- or 12d. ), meaning that they were substracting the number of pennies for their purchase from 12. So for example in the first question (as shown in the crib sheet), they started with twelve pennies and paid six pennies for a toy pram, leaving six. It seems that Winifred Ferrier's scheme was popular with both children and their parents. While it was a long way from modern interactive computing, it was certainly a giant leap forward compared to the traditional blackboard style of learning of the era. Some kids who passed the Woolworth test in the classroom, remember persuading their mums to take them into the High Street store on the way home. Some recall getting an ice cream wafer (for 1½d), and either two bouncy India rubber balls, six marbles, or a doll's hairbrush for fourpence, leaving a halfpenny to spare from a single sixpence. But history does not record whether when they got home and found the tap dripping into the bathroom they dashed to do the simultaneous equation to find out when the kitchen underneath would flood. One thing is for certain, they couldn't log on to the Internet and Google it !